The Westphal Recruitment Staff is here to help with any questions or concerns you might have regarding undergraduate and graduate admissions. Below you’ll find answers to some of the most commonly asked questions with links to guide you through the application and admissions process. Please contact us directly if you need additional information. Where can I find information about important dates for each term? The academic calendar provides information as to when classes start and end for each term including exam and break times. Can I submit my application directly to Westphal College? Application for admission, and all required application materials for admission should be submitted to the Admissions Office. Please do not submit application materials to the Westphal College. Your application will be compiled by the admissions office and made available to the college. Please submit materials by the appropriate application deadlines. Do any programs require an audition? Where can I find a list of courses available at Westphal? The course catalog for all majors is only available online. The catalog provides required courses for all degree programs along with course descriptions. How large of a class can a student expect? 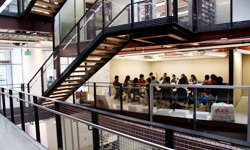 Our student to faculty ratio for many of our classes in the Westphal College is 15:1. What is Cooperative Education at Westphal? Cooperative education at Drexel enables full-time undergraduate students to alternate periods of classroom theory with professional experience prior to graduation. Participation in cooperative education is required for all Westphal College students. Cooperative education helps students explore and confirm their career choices. Co-op assists students in several areas of career development, including self-assessment, career exploration, and career experiences leading to full-time employment. Students develop confidence, professionalism, and a sense of purpose. With the exception of Music Industry majors and Entertainment and Arts Management majors, all Westphal College students go on co-op for six months in the junior year. Music Industry majors and Entertainment and Arts Management majors go on co-op in the summer of the sophomore and junior years. Does Westphal offer a Double-Major opportunity? It can be challenging to double major. While it is not impossible it can be difficult and require more time to complete both degrees. You can only declare one major coming into Drexel. After you have determined that major you can have a conversation with your academic advisor about double majoring. He or she will inform you of the requirements, and what it will take to pursue a second major. Drexel has many minor available to students who wish to combine academic interests. Often times it is easier to achieve coursework in varied areas of interest by completing a minor concentration while completing your major. What programs are available as a Minor at Westphal? Using free elective credits students can pursue a minor concentration. Drexel offers a variety of minor concentrations. Click the links below for available minors. Only undergraduate students who have successfully completed 30 credits of coursework are eligible to add a minor. Students must first meet with their academic advisor to ensure that the completion of the minor will be achieved at or before graduation. Are there examples of previous student work available? See what you have to look forward to as a student at the Westphal College of Media Arts & Design. Find a great selection of projects and designs created by our highly talented and creative students. Do I need to submit additional items during the application process? Some programs require a portfolio and/or writing supplement as part of the application. Please visit the Undergraduate Admissions website for those requirements. Does Westphal College accept Transfer students? Students are welcome to apply for transfer into any of our majors except the Music Industry program. The music industry program is not available to transfer applicants. To find out which courses will transfer from your previous institution you must first apply and be offered admission into the program. If you are accepted we will be able to inform you of which courses will transfer. We do not conduct transfer credit evaluations prior to a student being accepted. Students interested in transferring should review our transfer FAQ’s. Transfer admission requirements can be found here. Where can I find information about tuition at Westphal? Tuition information can be found on the Undergraduate Admissions website. Please note the Westphal College of Media Arts & Design majors follow the four-year tuition model. I'd like to visit, how can I do that? To maximize your visit experience we recommend scheduling a visit during one of our special undergraduate event dates or during the week for a daily visit where the Westphal College will be hosting special visit days. Please review the calendar for the dates specific to the Westphal College.